Over/Under: Over 172.0 at 1.90 Bet Now! While the form guide for the season suggests that this should be a reasonable home win for Baskonia, Galatasaray are on a strong run of form at the moment. 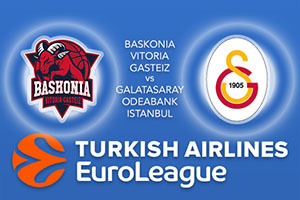 The 5-4 record against a 3-6 record with home advantage should tip this Euroleague game in favour of the Spanish side but the Turkish team has won three of their last four outings and this could turn out to be an exciting match-up on Friday evening. The hosts have played 4 games at home this season and they hold a 3-1 record. While Shane Larkin is doing very for his first year, offering an average of 14.2 points per game, the fact that there are six players in double figures for the Spanish side suggests that this is a squad game with many people who can chip in. Andrea Bargnani has provided an average of 13.2 points per game while Johannes Voigtmann has offered up an average of 12.2 points per game while also providing an average of 7.6 rebounds per game. There are enough good players in the Baskonia squad for them to grind out wins even when one or two are not at their best. The Turkish side lost their opening five games of the season and this led many observers to write them off. They are still in the wrong end of the Euroleague table but the fact that they have won three out of four games is definitely a big bonus for their fans. Justin Dentmon has been a key player, chipping in with an average of 13.4 points per game this season and he has been aided by Sinar Guler, who has offered an average of 11.1 points per game so far this season. Defensively, the Turkish side offer up too many points to have a great chance of glory, an average of 89.3 points per game, but they are battling hard to improve things. The hosts will fancy their chances of taking this game and you should take Baskonia Vitoria Gasteiz at -5, on offer at odds of 1.90. The Over/Under market is on offer and you should go OVER 172.0 at odds of 1.90. Bet Now!